Highmark Health CEO and President David Holmberg (right) addresses the crowd at the Northside Community Development Fund’s annual Partnership Recognition luncheon Nov. 6 at the Lexus Club in PNC Park. Over 200 people attended. 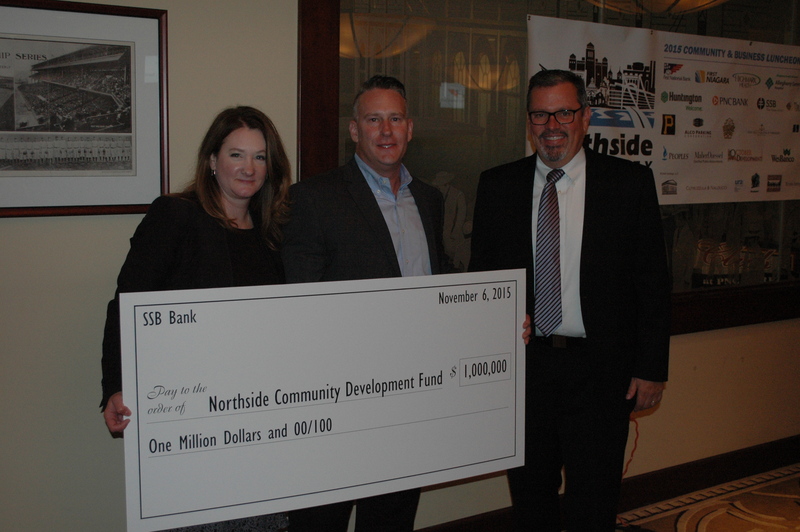 The Northside Community Development Fund (NSCDF) held its annual Partnership Recognition luncheon Friday, Nov. 6 at the Lexus Club in PNC Park. Highmark Health CEO and President David Holmberg served as the keynote speaker as over 200 guests attended, including numerous Northside business and community leaders, local elected officials, and small business and community development lenders. Holmberg commented on the role Allegheny General Hospital has played in creating a healthier and more productive neighborhood. “We help make sure that community is strong and healthy,” Holmberg said. “When you look at the Northside, it’s not just about Allegheny General, it’s about being a stabilizing force where jobs are created. Since 2000, the NSCDF has financed more than 200 Northside businesses and 18 strategic real estate projects, including providing acquisition funds for the redevelopment of the former ARC House site on East Ohio Street in Historic Deutschtown, and since 2006 has grown its loan capital base from $2 million to more than $14 million. Since 2006, 32 percent of the fund’s business loans and investments have been to minority-owned firms and 30 percent have been to women-owned firms. Both significant increases since Masterson became executive director in late 2006. The fund accepted six checks at the luncheon that will help further its work on residential and commercial lending, including a $1 million check presented by SSB Bank, which will assist community groups in acquiring real estate. From L to R: Jen Harris and J. Daniel Moon IV of SSB Bank pose with NSCDF Mark Masterson after presenting the fund with a $1 million check during the Northside Community Development Fund’s annual Partnership Recognition luncheon Nov. 6 at the Lexus Club in PNC Park.